How did I get myself into this one? Well in classic fashion it seemed like a good idea at the time! I was sat with some friends and we were all agreeing that running for the sake of running just to stay fit was getting a tad tedious. 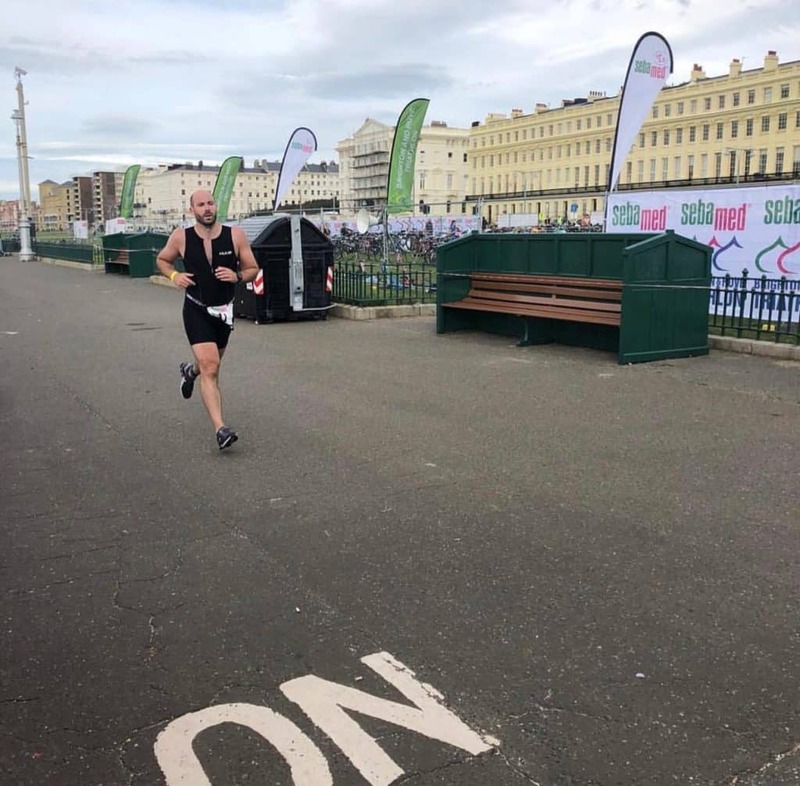 So one of our group suggested we get ourselves a challenge lined up… the result was we signed ourselves up to Brighton and Hove Triathlon. I think we all felt we could maybe push to the full distance on the Bike and the Run, but there was a real risk that we may drown trying to swim 1.5km! Having signed up the reality set in that I would need to get some training in to get myself ready. Particularly as the last time I had ridden a bike I was 18 years old! Thankfully a friend had an old road bike, which he kindly gave me, and I was all set to get training. My aim was to swim, cycle and run once a week. I have to say the variation in training was great. I never got bored of any one thing and the fact I was new to swimming and cycling these kinds of distances was great. The variation also meant that I felt niggle free the whole way through training which wasn’t the case when I ran the half marathon a few years ago. RACE DAY! In typical British fashion it was a grey windy September day so as you can imagine the sea wasn’t as flat as we had hoped for. Stood on Brighton beach in a wetsuit there was definitely a moment where I thought to myself why am I doing this! 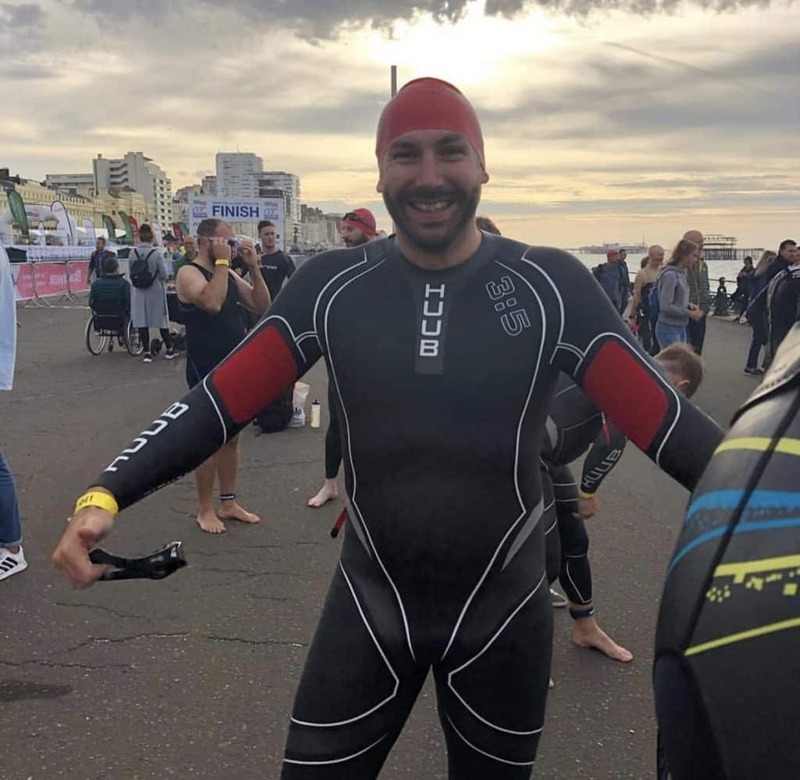 But once the hooter for the start of the race sounded all was forgotten, I personally found the swim the most challenging largely because of the conditions and I had done my training in a swimming pool where the conditions were somewhat easier! 20 minutes later I was coming out of the water, trying not to look to ridiculous ooing and arring on the stones of Brighton beach. 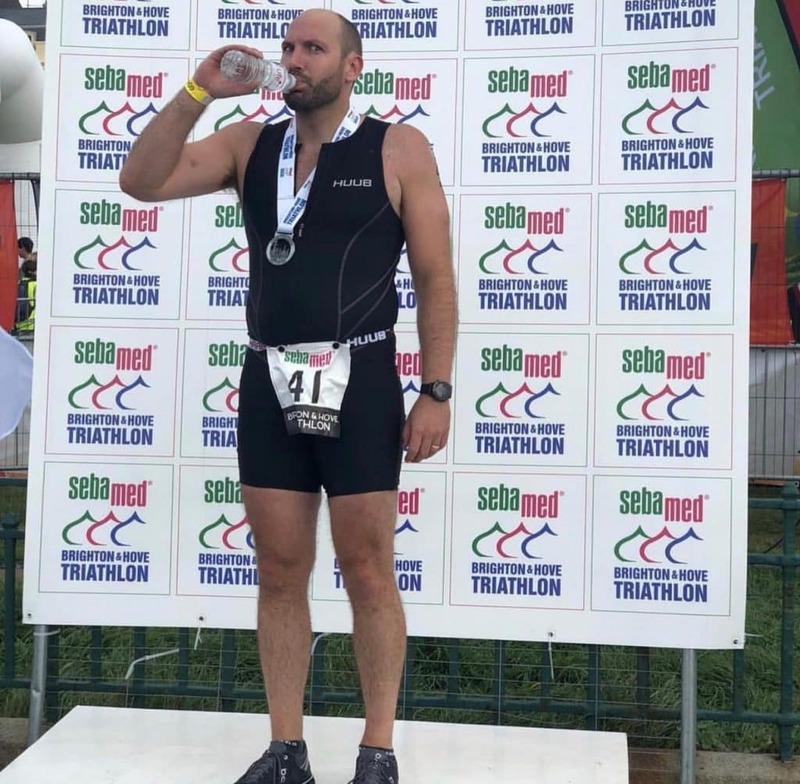 I made my way up to the transition zone for the first change over onto the bike and once I had wrestled my wetsuit off I was all set and headed out on the bike for the next stage of the race. I found this the most enjoyable section of the race, as the support was amazing! Brighton is a nice flat course and the road was closed so it was just a case of head down and pedal. 40 minutes later I was hoping I had correctly counted 4 laps and was headed back to the transition zone ready for the final stage… the run! If you have never tried cycling and then running I can assure you it is a pretty strange feeling for the first 1-1.5km your legs feel like lead and your body is saying ‘what are you doing!’ but after you get yourself through that they come back to life and you know in your head the end is nearing. 26 minutes later I crossed the finish line and the feeling was AMAZING! Such a buzz, once again the support was incredible. So if you asked me the question would I do it again? 100% so much so, I have already lined up Blenheim Palace for next June! If your training is getting repetitive and you are keen to add some variation to your training I would say that this is a great way to go. I also found having a group of friends all training for it also really helped, so why not get a group of you together to do it.